The Human Capital Index finds a clear correlation between an economy’s income level and its capacity to develop and deploy human capital—countries with higher gross national income (GNI) and GDP per capita have on average higher scores. 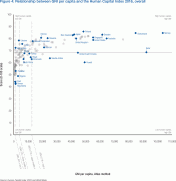 However, there are significant differences and overlaps within and between income brackets, with some lower-income countries far outperforming richer ones. 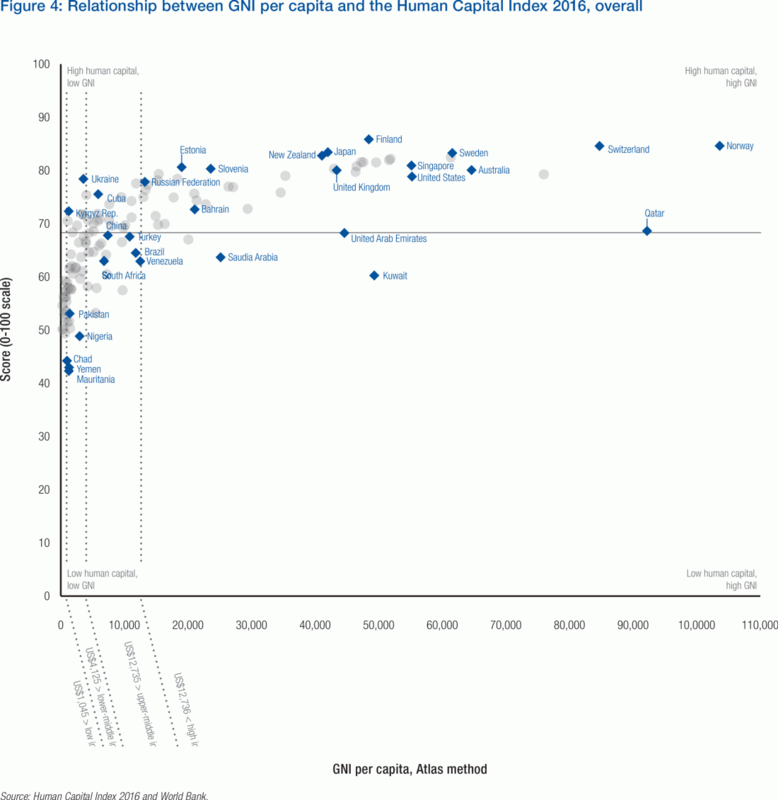 Out of the 49 economies covered by the Index in the high income bracket (those with a GNI per capita above US$12,736), all 19 economies passing the 80% human capital optimization threshold belong to this group, while 22 high income economies score in the 70% to 80% range and eight in the 60% to 70% range. Among the 32 countries covered by the Index in the upper-middle income bracket (those with a GNI per capita between US$4,126 and US$12,735), 12 countries score within the 70% to 80% tier, 16 countries within the 60% to 70% tier and four have not yet crossed the 60% threshold. Within the lower-middle income group (countries with a GNI per capita between US$1,046 and US$4,125), six out of 33 countries covered by the Index score above 70%, 14 countries score in the 60% to 70% range and 13 have not crossed the 60% threshold. Finally, none of the 16 low income economies (those with a GNI per capita under US$1,045) covered by the Index have yet maximized 60% of their human capital potential or more, although Uganda (99) and Cambodia (100) come close. 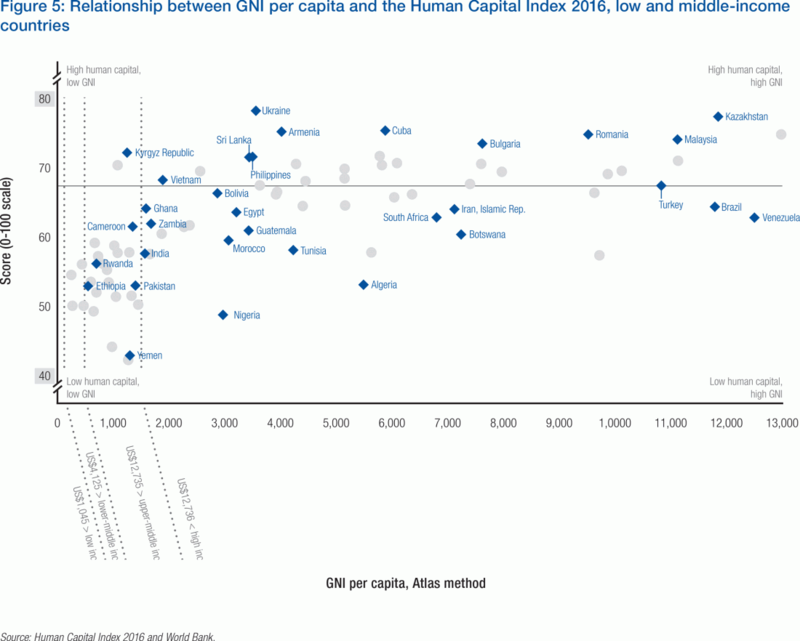 Figures 4 and 5 display the correlation between GNI per capita levels and performance on the Human Capital Index. For example, Australia (18) and Estonia (15) are practically tied in their human capital outcomes but record very different GNI per capita levels. Conversely, despite very similar GNI per capita levels, Ghana (84) significantly outperforms Nigeria (127), indicating that human capital investment and planning can make a difference to a nation’s human capital endowment regardless of where it falls on the global income scale. Creating a virtuous cycle of this nature should be the aim of all countries.